Shoulder dislocations constitute up to 50% of all major joint dislocations. Anterior dislocations occur in as many as 97% of cases. Anterior displacement of the humeral head is the most common dislocation seen by emergency physicians and is depicted in the image below. Y-view radiograph of the right shoulder shows anterior dislocation of the humeral head relative to the glenoid fossa. Procedural sedation and analgesia (PSA) protocols, intra-articular lidocaine, and ultrasound-guided brachial plexus nerve block assist in making reduction an easier and more comfortable procedure. For excellent patient education resources, visit eMedicineHealth's First Aid and Injuries Center. Also, see eMedicineHealth's patient education article Shoulder Dislocation. Age is a major factor in the likelihood of sustaining a recurrent shoulder dislocation. Approximately 80-94% of patients younger than 20 years at the time of the initial dislocation have a recurrence. The major pathology in this age group is thought to be a Bankart lesion with associated inferior glenohumeral ligament injury. Of patients younger than 40 years, 26-48% develop recurrent dislocation. The major pathology for this age group is thought to be disruption of the labral attachment of the glenohumeral ligaments. Dislocation recurs in only 0-10% of patients older than 40 years. Rotator cuff tear is the major pathology. Minor trauma that results in a dislocation is associated with an 86% recurrence rate. Many orthopedic surgeons believe that more than one complete anterior dislocation justifies considering surgical repair. Vezeridis PS, Ishmael CR, Jones KJ, Petrigliano FA. Glenohumeral Dislocation Arthropathy: Etiology, Diagnosis, and Management. J Am Acad Orthop Surg. 2018 Oct 1. [Medline]. Pescatore R, Nyce A. Managing Shoulder Injuries in the Emergency Department: Fracture, Dislocation, and Overuse. Emerg Med Pract. 2018 Jun. 20 (6):1-28. [Medline]. Abrams R, Akbarnia H. Dislocation, Shoulder (Humerus). 2018 Jan. [Medline]. [Full Text]. Zhang AL, Montgomery SR, Ngo SS, Hame SL, Wang JC, Gamradt SC. Arthroscopic versus open shoulder stabilization: current practice patterns in the United States. Arthroscopy. 2014 Apr. 30(4):436-43. [Medline]. [Guideline] Shoulder complaints. Elk Grove Village (IL): American College of Occupational and Environmental Medicine (ACOEM); 2004. [Full Text]. Abrams R, Akbarnia H. Dislocation, Shoulder (Humerus). StatPearls. 2017 Jun. [Medline]. [Full Text]. Nambiar M, Owen D, Moore P, Carr A, Thomas M. Traumatic inferior shoulder dislocation: a review of management and outcome. Eur J Trauma Emerg Surg. 2017 Oct 3. [Medline]. Konda SR, Fisher N, Gage M, Egol KA. Posterior Fracture Dislocation of the Shoulder: A Modified McLaughlin Procedure. J Orthop Trauma. 2017 Aug. 31 Suppl 3:S36-S37. [Medline]. Kokkalis ZT, Iliopoulos ID, Antoniou G, Antoniadou T, Mavrogenis AF, Panagiotopoulos E. Posterior shoulder fracture-dislocation: an update with treatment algorithm. Eur J Orthop Surg Traumatol. 2017 Apr. 27 (3):285-294. [Medline]. Walz DM, Burge AJ, Steinbach L. Imaging of shoulder instability. Semin Musculoskelet Radiol. 2015 Jul. 19 (3):254-68. [Medline]. William Micheo, MD, Brenda Castillo, MD, Jose R. Vives, MD, et al. SHOULDER FRACTURES, SEPARATION-DISLOCATION, AND OTHER SOFT TISSUE INJURIES. American Academy of Physical Medicine and Rehabilitation. Available at https://now.aapmr.org/shoulder-fractures-separation-dislocation-and-other-soft-tissue-injuries/. 09/20/2014; Accessed: 09/06/2018. Kraeutler MJ, Currie DW, Kerr ZY, Roos KG, McCarty EC, Comstock RD. Epidemiology of Shoulder Dislocations in High School and Collegiate Athletics in the United States: 2004/2005 Through 2013/2014. Sports Health. 2018 Jan/Feb. 10 (1):85-91. [Medline]. Slattery C, Kovalenko B, Verma K. Congenital anterior shoulder dislocation in a newborn treated with closed reduction. Radiol Case Rep. 2018 Oct. 13 (5):920-924. [Medline]. Kroner K, Lind T, Jensen J. The epidemiology of shoulder dislocations. Arch Orthop Trauma Surg. 1989. 108(5):288-90. [Medline]. Hovelius L. Incidence of shoulder dislocation in Sweden. Clin Orthop Relat Res. 1982 Jun. (166):127-31. [Medline]. Rhee YG, Cho NS, Cho SH. Traumatic anterior dislocation of the shoulder: factors affecting the progress of the traumatic anterior dislocation. Clin Orthop Surg. 2009 Dec. 1(4):188-93. [Medline]. [Full Text]. Watson S, Allen B, Grant JA. A Clinical Review of Return-to-Play Considerations After Anterior Shoulder Dislocation. Sports Health. 2016 Jul. 8 (4):336-41. [Medline]. DeFroda SF, Goyal D, Patel N, Gupta N, Mulcahey MK. Shoulder Instability in the Overhead Athlete. Curr Sports Med Rep. 2018 Sep. 17 (9):308-314. [Medline]. Groh GI, Wirth MA, Rockwood CA Jr. Results of treatment of luxatio erecta (inferior shoulder dislocation). J Shoulder Elbow Surg. 2009 Oct 15. [Medline]. [Guideline] Steinbach LS, Daffner RH, Dalinka MK, DeSmet AA, El-Khoury GY, Kneeland JB, Manaster BJ, Morrison WB, Pavlov H, Rubin DA, Weissman BN, Haralson RH III, Expert Panel on Musculoskeletal Imaging. Shoulder trauma. [online publication]. Reston (VA): American College of Radiology (ACR); 2005. [Full Text]. Ozaki R, Nakagawa S, Mizuno N, Mae T, Yoneda M. Hill-Sachs Lesions in Shoulders With Traumatic Anterior Instability: Evaluation Using Computed Tomography With 3-Dimensional Reconstruction. Am J Sports Med. 2014 Sep 17. [Medline]. Horst K, Von Harten R, Weber C, Andruszkow H, Pfeifer R, Dienstknecht T, et al. Assessment of coincidence and defect sizes in Bankart and Hill-Sachs lesions after anterior shoulder dislocation: a radiological study. Br J Radiol. 2014 Feb. 87(1034):20130673. [Medline]. [Full Text]. Kanji A, Atkinson P, Fraser J, Lewis D, Benjamin S. Delays to initial reduction attempt are associated with higher failure rates in anterior shoulder dislocation: a retrospective analysis of factors affecting reduction failure. Emerg Med J. 2015 Jun 25. [Medline]. Liu HH, Lee YH, Yang SW, Wong CY. Fracture of the proximal humerus with intrathoracic dislocation of the humeral head. J Trauma. 2007 Aug. 63(2):E37-9. [Medline]. Saxena V, D'Aquilla K, Marcoon S, Krishnamoorthy G, Gordon JA, Carey JL, et al. T1ρ Magnetic Resonance Imaging to Assess Cartilage Damage After Primary Shoulder Dislocation. Am J Sports Med. 2016 Jul 27. [Medline]. Khiami F, Gérometta A, Loriaut P. Management of recent first-time anterior shoulder dislocations. Orthop Traumatol Surg Res. 2015 Feb. 101 (1 Suppl):S51-7. [Medline]. Kane P, Bifano SM, Dodson CC, Freedman KB. Approach to the treatment of primary anterior shoulder dislocation: A review. Phys Sportsmed. 2015 Feb. 43 (1):54-64. [Medline]. Mackenzie DC, Liebmann O. Point-of-Care Ultrasound Facilitates Diagnosing a Posterior Shoulder Dislocation. J Emerg Med. 2013 May. 44(5):976-8. [Medline]. Beck S, Chilstrom M. Point-of-care ultrasound diagnosis and treatment of posterior shoulder dislocation. Am J Emerg Med. 2013 Feb. 31(2):449.e3-5. [Medline]. Reid S, Liu M, Ortega H. Anterior shoulder dislocations in pediatric patients: are routine prereduction radiographs necessary?. Pediatr Emerg Care. 2013 Jan. 29(1):39-42. [Medline]. Kahn JH, Mehta SD. The role of post-reduction radiographs after shoulder dislocation. J Emerg Med. 2007 Aug. 33(2):169-73. [Medline]. Jordan RW, Naeem R, Srinivas K, Shyamalan G. A comparison of magnetic resonance arthrography and arthroscopic findings in the assessment of anterior shoulder dislocations. Skeletal Radiol. 2015 May. 44 (5):653-7. [Medline]. Akyol C, Gungor F, Akyol AJ, Kesapli M, Guven R, Cengiz U, et al. Point-of-care ultrasonography for the management of shoulder dislocation in ED. Am J Emerg Med. 2016 May. 34 (5):866-70. [Medline]. Helfen T, Ockert B, Pozder P, Regauer M, Haasters F. Management of prehospital shoulder dislocation: feasibility and need of reduction. Eur J Trauma Emerg Surg. 2015 Jul 9. [Medline]. Handoll HH, Almaiyah MA, Rangan A. Surgical versus non-surgical treatment for acute anterior shoulder dislocation. Cochrane Database Syst Rev. 2004. (1):CD004325. [Medline]. Matthews DE, Roberts T. Intraarticular lidocaine versus intravenous analgesic for reduction of acute anterior shoulder dislocations. A prospective randomized study. Am J Sports Med. 1995 Jan-Feb. 23(1):54-8. [Medline]. Wakai A, O'Sullivan R, McCabe A. Intra-articular lignocaine versus intravenous analgesia with or without sedation for manual reduction of acute anterior shoulder dislocation in adults. Cochrane Database Syst Rev. 2011 Apr 13. 4:CD004919. [Medline]. Dunn MJ, Mitchell R, Souza CD, Drummond G. Evaluation of propofol and remifentanil for intravenous sedation for reducing shoulder dislocations in the emergency department. Emerg Med J. 2006 Jan. 23(1):57-8. [Medline]. Chalidis B, Sachinis N, Dimitriou C, Papadopoulos P, Samoladas E, Pournaras J. Has the management of shoulder dislocation changed over time?. Int Orthop. 2007 Jun. 31(3):385-9. [Medline]. Hawkins RJ, Neer CS, Pianta RM, Mendoza FX. Locked posterior dislocation of the shoulder. J Bone Joint Surg Am. 1987 Jan. 69(1):9-18. [Medline]. Cunningham NJ. Techniques for reduction of anteroinferior shoulder dislocation. Emerg Med Australas. 2005 Oct-Dec. 17(5-6):463-71. [Medline]. De Palma AF. Surgery of the Shoulder. 3rd ed. 1983. Hovelius L, Augustini BG, Fredin H, Johansson O, Norlin R, Thorling J. 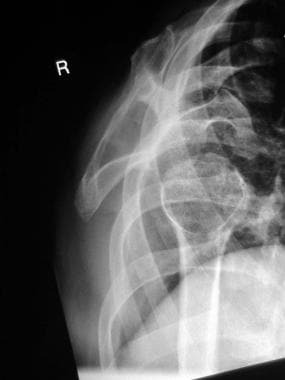 Primary anterior dislocation of the shoulder in young patients. A ten-year prospective study. J Bone Joint Surg Am. 1996 Nov. 78(11):1677-84. [Medline]. Jagim M. Procedural sedation in the emergency department: where do we draw the line?. J Emerg Nurs. 2007 Oct. 33(5):488-91. [Medline]. Kelley SP, Hinsche AF, Hossain JF. Axillary artery transection following anterior shoulder dislocation: classical presentation and current concepts. Injury. 2004 Nov. 35(11):1128-32. [Medline]. Kuhn JE. Treating the initial anterior shoulder dislocation--an evidence-based medicine approach. Sports Med Arthrosc. 2006 Dec. 14(4):192-8. [Medline]. Medical Economics Data. Physicians' Desk Reference. Medical Economics Data; 2005. Mirick MJ, Clinton JE, Ruiz E. External rotation method of shoulder dislocation reduction. JACEP. 1979 Dec. 8(12):528-31. [Medline]. Roberts JR, Hedges JR, eds. Clinical Procedures in Emergency Medicine. 4th ed. Philadelphia: W B Saunders; 2003. Sagarin MJ. Best of both (BOB) maneuver for rapid reduction of anterior shoulder dislocation. J Emerg Med. 2005 Oct. 29(3):313-6. [Medline]. Simon RR, Koenigsknecht SJ, Stevens C. Emergency Orthopedics: The Extremities. 2nd ed. Appleton & Lange; 1987. Simonet WT, Melton LJ 3rd, Cofield RH, Ilstrup DM. Incidence of anterior shoulder dislocation in Olmsted County, Minnesota. Clin Orthop Relat Res. 1984 Jun. (186):186-91. [Medline]. Socransky SJ, Toner LV. Intra-articular lidocaine for the reduction of posterior shoulder dislocation. CJEM. 2005 Nov. 7(6):423-6. [Medline]. Summers A. Shoulder dislocation: reduction without sedation in the emergency department. Emerg Nurse. 2007 Apr. 15(1):24-8. [Medline]. Yamamoto T, Yoshiya S, Kurosaka M, Nagira K, Nabeshima Y. Luxatio erecta (inferior dislocation of the shoulder): a report of 5 cases and a review of the literature. Am J Orthop. 2003 Dec. 32(12):601-3. [Medline]. Zahiri CA, Zahiri H, Tehrany F. Anterior shoulder dislocation reduction technique--revisited. Orthopedics. 1997 Jun. 20(6):515-21. [Medline].